182 pages | 29 B/W Illus. Does the CNN Effect exist? Political communications scholars have debated the influence of television news coverage on international affairs since television news began, especially in relation to the coverage of massive human rights violations. These debates have only intensified in the last 20 years, as new technologies have changed the nature of news and the news cycle. But despite frequent assertion, little research into the CNN Effect, or whether television coverage of human rights violations causes state action, exists. 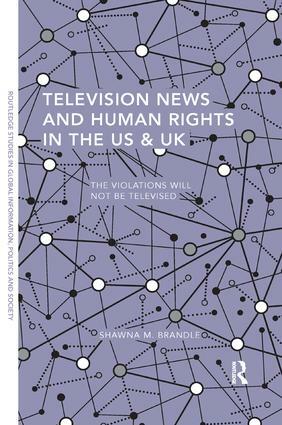 Bridging across the disciplines of human right studies, comparative politics, and communication studies in a way that has not been done, this book looks at television news coverage of human rights in the US and UK to answer the question of whether the CNN Effect actually exists. Examining the human rights content in television news in the US and UK yields insights to what television news producers and policy makers consider to be human rights, and what, if anything, audiences can learn about human rights from watching television news. After reviewing 20 years of footage using three different types of content analyses of American television news broadcasts and two different types of British news broadcasts, and comparing those results with human rights rankings and print news coverage of human rights, Shawns M. Brandle concludes that despite rhetoric from both countries in support of human rights, there is not enough coverage of human rights in either country to argue that television media can spur state action on human rights issues. More simply, the violations will not be televised. A welcome and timely book presenting an important examination of human rights coverage on television news. Shawna M. Brandle is an Assistant Professor of Political Science at Kingsborough Community College, New York. Her interests include media and international relations.